I don’t know if it’s the bed of the nozzle or some other magic…but I can’t get anything to stick to the bed. I’m one of the very early backers and things were OK for about 3 prints. Then i started using the tape and glue method to create some sort of adhesion to the heated bed and had good success with that. But now, I can’t get anything to stick to the bed regardless what I do. Anyone have any good ideas? What app are you using to print? 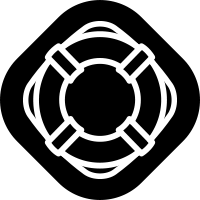 Consider using a RAFT base. Calibrated multiple times. Have been using the snapmaker app for printing. I’ll try the RAFT suggestion. Thanks. I would also suggest cleaning the bed (rubbing alcohol) and re-calibrating the bed. I have been using 3D printers for quite a few years and I’m still not sure how close the z-home should be to the bed. And now with the snapmaker, I’m not really sure how to use the “paper under nozzle” calibration method at all! Should it be close enough without any resistance? some resistance? impossible to move? In the end I usually aim for the same “some resistance” for each of the 4 calibration points, and the first layer to be somehow squished (no separation between printed lines). @rgriffogoes Thanks. Things I’ve tried with regard to the bed: Clean with alcohol, cover with blue tape, use gluestick glue on top of blue tape (I’ve had most success with this but seems janky). I too go for some resistance with the calibration points but still no luck. I haven’t actually been able to print anything successfully for some months now. What I’m seeing mostly is after the initial extrusion of filament outside the print area, not even the very first layer of skirt or raft will stick. I’m using PLA…which has been sitting next to my printer in my office for 6 months. Is PLA fickle enough to be ruined sitting in Virginia humidity for that long? Everyone will say that PLA and PETG will absorb humidity like crazy, and then you have to “bake” the filament spool to get rid of the humidity. But to be honest I never did it, and my filaments were in the open (inside heated/air conditioned house) for quite some time without issues. Now I simply have a plastic box with “eva-dry reusable dehumidifier” for the filaments (but the current one stays in the printer for weeks). With my previous printer I used a glass non-heated bed and had great results with glue stick (some glue, some water, spread with finger). With Snapmaker I’m getting good results with the plain bed, heated to just 40c (PLA was warping like crazy when using 60+). You could try to post some pictures and then we can try to guess what’s wrong. I have problems with dust on the bed. It doesn’t take much before the print won’t stick. A quick wipe with a lint free cloth followed by an alcohol swab will usually take care of that. But sometimes that’s not enough, and I just let the printer run for a bit, then abort. Hot PLA does a really good job of picking up dust , and the second attempt will usually stick. It’s possible that you need to replace your bed sticker. They are designed to be a consumable, but I haven’t had to replace mine yet. I got one of the last kickstarter batches though. I’ve had my unit a little over 6 months, and my initial bed sticker is still working well. Regarding calibration, I too was confused about the amount of force required for the paper. I ended up starting with something that was two 0.05mm steps looser than “the paper won’t move, and I’m afraid I’ll tear it if I pull harder”. That ended up being much too tight. I tried to print the 0.1mm version of https://www.thingiverse.com/thing:2125379. The nozzle was so close that the first layer lines would squish out wider than it was supposed to, and lift previous lines off the bed. I could see the print lifting off as the head moved past, and hear crackling. I spent a while printing just the two outer walls, aborting, and adjusting the calibration by hand, until it visually looked even. Once I got a nice line that didn’t look too short or extra wide, I printed the whole thing. I was able to print with only a few spots lifting towards one corner. I adjusted that corner up another 0.05mm, and got a pretty good print. It took a lot more time than the paper, but I’m much happier with the print with a large base. I took some pictures if anybody is interested, and I’m thinking of posting my experience. The only problem is that now the calibration is inconstant and loose. On calibration point 1, I can pull the paper out relatively easy, but I can’t push it back in. On calibration point 4, I can slide the paper in all directions with only a tiny bit of resistance. But the print is much better than when point 4 has the same pressure as point 1. Because of this very loose spot, dust on the bed is an even bigger problem. If you want to try this, make sure you have the latest firmware first. I had to recalibrate after updating, which is what prompted my experimentation. I forgot to mention that I usually raise the initial layer temps. I was having about 1 print in 4 fail to adhere from the start, using the default settings of bed temp 50ºC, nozzle temp of 200ºC. I raised the initial bed temp to 60ºC and initial nozzle temp to 210ºC, and I’ve only had adhesion problems when I forget to clean the bed before printing. I did my calibration process using initial layer 60ºC/210ºC, remaining layers 50ºC/200ºC. always use the same kind of paper. preferably something a little thicker, like 120 or 150 grams, but not too heavy like inkjet photo glossy. And it has to be coated or surface treated. A theater ticket wil do nice. Just do not use plain 80 grams office paper, too thin and coarse. Then to be sure, tighten all thumb-screws about the same amount; not as hard as possible, but just the same tight. Then when the paper is in between nozzle and surface, you should feel resistance, but it should still be possible to push the paper back and forth with two fingers, and all points must feel the same. The easiest way is to go down until you cannot push the paper back, and then go up until you can. If you have done it, do not forget to press the save button. And if possible measure the first layer with a caliper. It you print at 0.2 with a 0.3 base layer, the brim or skirt should measure 0.3 also. @Broomer68 @doug @clewis @rgriffogoes Great information from everyone. Thanks all for the info. Still no love here. Changed settings to those recommended by @clewis. Just cleaned the bed with alcohol and a lint free wipe. Here’s the video. posted a link thought it would embed…will post the embed if i can. increase the initial layer line width to be 130%. @Jade Thanks for the recommendations. Any idea where to get a new snapmaker bed sticker? Also, heating the bed makes blue tape adhesive much less strong so opt for printing without heated bed. What I do is cover the area I want to print with blue tape, then two more strips across and over two opposite edges of the print bed, transversal to the other tapes to hold them down. Always store filaments airtight, buckets are the most cost-effective way. After 6-12 months they will start to noticeably degrade. Especially transparent filaments! You can leave comments on the article above to let Snapmaker team know your feedback. You’re not authorized to access this page. What should I do if the first layer does not stick to the heated bed? Lowering initial layer speed, using raft, increasing the line width, and slightly increasing the first layer heat of the bed and nozzle, are also things I mess with to make mine stick. I think going raft is the most useful of this bunch, but all seem to help in certain applications. 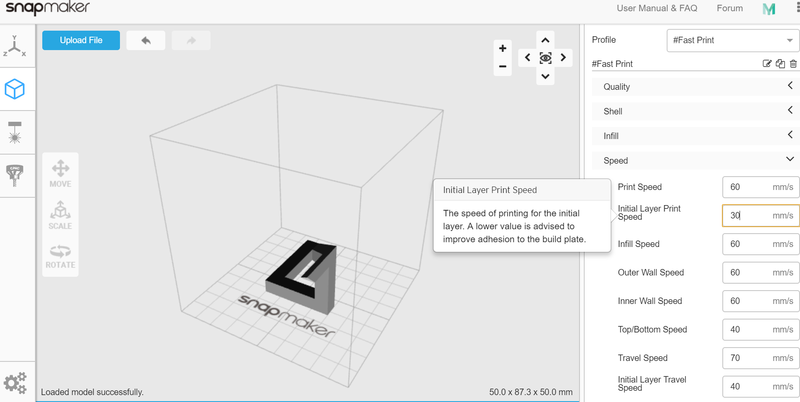 I’m a newbie to 3D printing and have a snapmaker 3-in-1 running snapmaker.js V2.5.4. , I had initial bed adhesion problems on the first couple of prints, but after looking at the temps suggested on my reels of filament, I found that if I used “Custom” material instead of the “PLA” button and increased the build plate temperature to 60 degrees C and increased the nozzle temperatures to 230C for the first layer and 220C for the print temp I had good adhesion and much better print quality with PLA. I wish the PLA and ABS buttons in snapmaker.js could be customized individually instead of having to use the “custom” button and changing temps every time I switch filament between PLA and ABS, but using the above temperatures, I’m getting near perfect PLA prints every time. Off topic here but for anyone wanting them, my ABS temperatures worked out to: Print temp 245, first layer 255 and bed temps 90 degrees C.